Alicia Hall Moran as Bess and Nathaniel Stampley as Porgy. Photo by Michael J. Lutch. 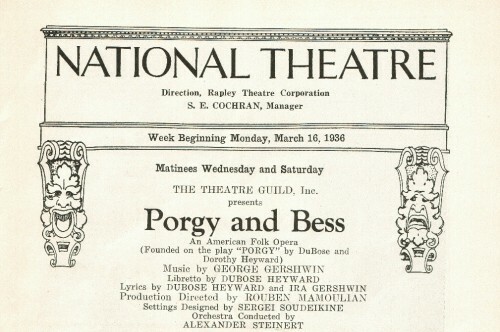 In March of 1936, the first touring production of Porgy and Bess made history at the National Theatre by being the theatre’s first fully integrated audience. Todd Duncan, the original Porgy and a Howard University music professor, along with Anne Brown, the original Bess and a Baltimore native, led the cast in a strike until management at the National Theatre agreed to temporarily set aside its segregation policy. It is fitting that the national tour of this American masterpiece is back at the National Theatre where theatre patrons have the opportunity to see it for one week only through December 29th. 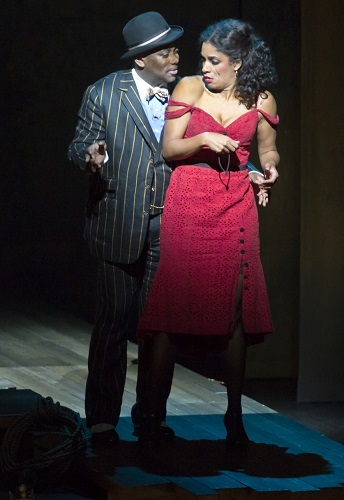 ‘The Gershwins’ Porgy and Bess’ is a winner!…an American masterpiece. It is interesting to note that Todd Duncan was one of the voice teachers of baritone Daniel Comegys who is my voice teacher. In a phone interview with Mr. Comegys I asked him to recall any stories he could share about Mr. Duncan. He mentioned that at the time he auditioned for the role of Porgy, Mr. Duncan was in an opera company in Manhattan. At the audition he sang a few arias for George Gershwin. Impressed, George Gershwin asked, “Will you be my Porgy”? Todd Duncan replied, “I don’t know. I’ll have to hear your music first.” He, of course said yes and went on to be the creator of the role of Porgy. Kingsley Leggs (Sporting Life) and Alicia Hall Moran (Bess). Photo by Michael J. Lutch. Based on DuBose Heyward’s novel “Porgy” and the play of the same name, which he co-wrote with his wife Dorothy Heyward, the story is set in the late 1930s in Charleston, South Carolina’s fabled Catfish Row. It deals with issues that are still very relevant today, including drugs, discrimination, and sexual and physical violence. In this story the beautiful, but troubled Bess (Alicia Hall Moran) tries to escape her abusive boyfriend Crown (Alvin Crawford) and a dope peddler named Sporting Life (Kingsley Leggs) who is constantly trying to get her high. In love for the first time, Porgy (Nathaniel Stampley), a disabled begger does everything in his power to try and rescue Bess. 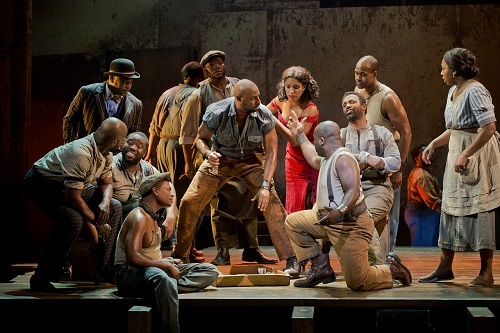 The Gershwins’ Porgy and Bess is a musical theatre adaptation of the original opera. Making it more accessible for today’s audience, this fresh version takes much of the recitative and turns it into dialog. Also, the singers wear microphones which are not often found in operas. This production features a grand 23-piece orchestra which is large by Broadway standards, but small for opera. 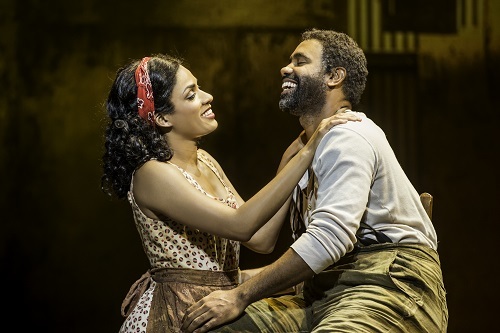 Some opera purists may wonder, why change perfection, while others understand that adapting Porgy and Bess into a musical theatre piece will entice audiences who otherwise might not go to the opera to enjoy this important story and glorious music. For me, as a trained singer, I appreciate both versions. The cast. Photo by Michael J. Lutch. Alicia Hall Moran makes for a believable and beautiful Bess. 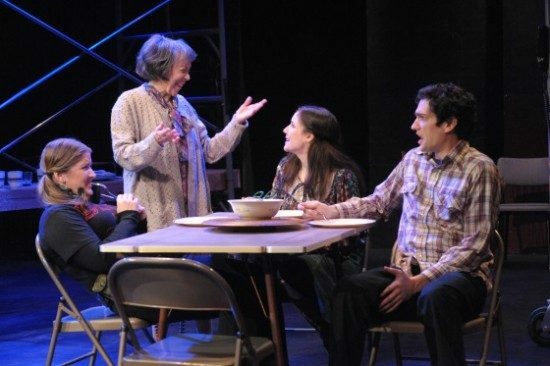 Under the skillful direction of Diane Paulus, she was most effective in expressing her characters inner turmoil through her nervous silence. For example, the moments when I would see her character tempted to take dope really had me pulling for her to succeed in not giving into temptation. Alicia Hall Moran is no stranger to the role of Bess. She was the Bess alternate and understudy in Broadway’s Tony-Winning production. From the moment Nathaniel Stampley stepped upon the stage as Porgy, he had my full attention. In what I believe is the finest performance I have seen all year, Mr. Stampley embodies the role of Porgy. It is apparent his performance is focused. All the important elements of his character as it changes through the story shine through. Seeing his facial expression after Bess stayed with him at his place for the first time was priceless. Alvin Crawford, the tallest member of the cast, is fierce in his role as Crown, a tough and mean dockworker who will do anything to keep Bess, even if it means violence. Being so tall and being so muscular, he has no trouble being intimidating. The Gershwins’ Porgy and Bess is a winner! It is my conclusion that the idea to present the opera as a musical theatre piece is one that works very well. It is nice to know that the opera version of Porgy and Bess will always be there to produce, but I do like how this accessible version is exposing new audiences to the important story by DuBose Heyward and Gershwin’s timeless music. Porgy and Bess is indeed an American masterpiece. 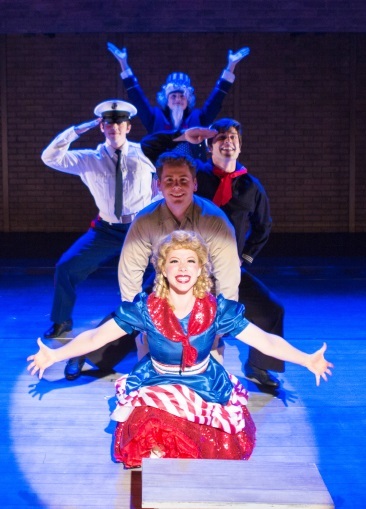 Will more operas be adapted into musical theatre versions? The Gershwins’ Porgy and Bess plays through this Sunday, December 29, 2013 at The National Theatre – 1321 Pennsylvania Avenue, NW, in Washington, DC. Visit online for tickets. Poster of ‘Porgy and Bess’ from 1936 at The National Theatre. Photo courtesy of The National Theatre.